The knowns and unknowns of postpartum seem daunting and overwhelming to many new parents. Most want to know what to expect and how to avoid postpartum stress triggers. Because of this, in my childbirth classes we discuss what we think our potential postpartum stress triggers may be and brainstorm possible solutions for the most irritating, pressing, or scary. While I can’t promise a stress-free postpartum, this post will help new parents become aware of potential postpartum stress triggers and facilitate brainstorming all possible solutions in order to minimize stress during the postpartum transition. 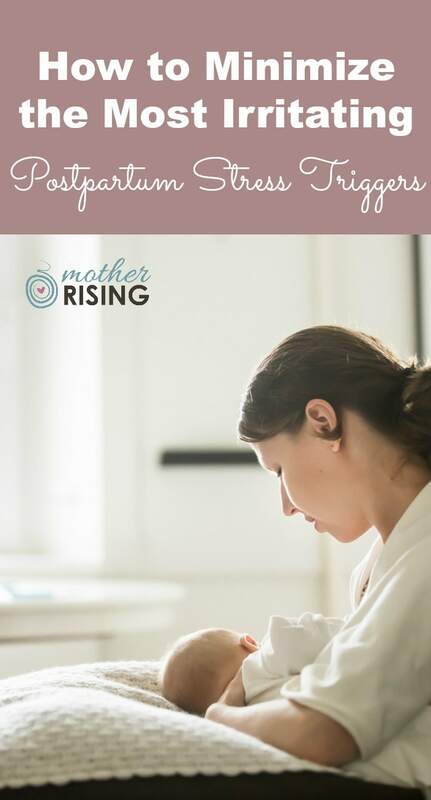 What are YOUR Postpartum Stress Triggers? After looking at the above list, I’m guessing that most parents can identify with at least 2-3. Everybody has some form of a postpartum stress trigger they’re hoping to avoid. Take a moment and write down your top three postpartum stressors (things you’re worried about that would happen in the first six weeks after birth). These could be on the list, or something else unique to you and your situation. Next, have your partner do the same. Once you both have your two lists of three postpartum stress triggers, pick your favorite (or in this case least favorite) you’d like to work with right now. Circle it. Finally, with your partner choose a favorite solution and brainstorm ways to implement it. TIP: If applicable, write down how this solution could be implemented now. It’s much easier to introduce a new system or way of doing things during pregnancy than it is with a new baby. For example, if you need to help your dog adjust to the new baby and currently said dog sleeps in the bed with you, start transitioning your dog out of your bedroom NOW. Now that I’ve had three babies and experienced postpartum three times, I’ve learned what makes me tick. Or, let me rephrase that, I’ve learned what makes me turn into a crazy, emotional, strung out, postpartum mama. It’s not lack of sleep or wonky hormones, although those don’t help matters at all, and it’s not breastfeeding or baby care. My #1 postpartum stress trigger is actually quite common – it’s a cluttered, dirty, disorganized home (it’s bolded on the list above lol). Let’s just say things don’t look or feel as serene as the stock photo below. After I had my first child, this particular issue wasn’t really that impactful. We only had one baby! Whatever help I needed with laundry or vacuuming, for example, my husband or mother had it taken care of. Said baby wasn’t mobile, so any extra messes he made was quite containable and very manageable. Sure, we had more work to do, but it was easily spread to other available helpers. I got so frustrated and anxious I decided to hang out more in my bedroom and less in the common areas of my home. Once I was in my bedroom I cleaned and picked up my room and then made sure to maintain it. By doing this I was embracing the “Ostrich Theory” (this is totally a legit thing). This theory states that if you can’t see it, it isn’t really there. In all honestly, I think this was a great solution to a problem that my postpartum self could not handle. All my time and attention was focused on bedrest, recovery, taking care of myself, and our new baby. The clutter issue just wasn’t mine to tackle, at least not at that point in time. However, this solution was very short sighted and not sustainable especially in the long run when considering adding yet another child to the mix. Let’s talk about what I did differently when I had my third baby. This is the one main things I did differently to prepare for and minimize my most irritating postpartum stress trigger for my third postpartum experience. For my third and final baby, I knew something had to change. It was unreasonable to think the best way to cope through postpartum was to hide in my room for the first six weeks and then emerge once I was able to get back in the swing of things. Perhaps there was a different solution. And indeed, there was. 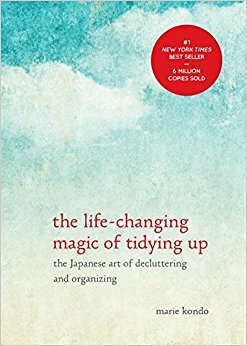 The first thing I did was to read the book The Life Changing Magic of Tidying Up. This book gave me a new perspective on how to see my possessions and my home. It was KEY to minimizing my postpartum stress triggers after I had my third child. • Created storage space for baby #3’s things. • Purged furniture that I loved once upon a time, but just didn’t work for us anymore. • Bought bunk beds which created more space in the big kid’s room. • Bought hooks for the kids to hang their jackets/bags on. • Bought carts which helped make the few things we had in our living spaces have a home and look cute too. Raskog carts spark so much joy for me! • Lowered the plates in the cabinets so that my 5 year old could help unload the dishwasher. • Purged, cleaned and reorganized my cabinets and pantry. This was amazing! Minimizing the most irritating postpartum stress triggers will look different for everyone. I encourage you to take some time to do the exercises described in the first few paragraphs to figure out what yours may be. By brainstorming solutions during pregnancy to prepare for postpartum, you will feel more prepared for the what’s to come and also reduce stress that’s coming your way. I know that spending time planning for ways to make it easier to maintain a clean, less cluttered and more organized home absolutely helped me cope through the stress of adding a third child to our family. It’s a bit more work upfront, but the payoff is big! You can do it! I am with you!! Baby #3 is due at the end of August, and I also have realized that the clutter and mess is going to drive me crazy postpartum…. the tricky part is, I’m married to a messy! Thanks for this post! I feel validated that I am not the only one who goes crazy with messiness! 🙂 Good luck on baby 3! Yes! Hubby asked yesterday why some of the items on our to do list were important. Because I know the guest room is a mess and I know the storage room is a disaster zone. And it will not happen after the baby arrives.